On June 21, His Beatitude Archbishop Nourhan Manougian, Armenian Patriarch of Jerusalem, visited the Mother See of Holy Etchmiadzin, to renew his oath in front of the Holy Altar of Descent, following his recent election. Accompanying Patriarch Nourhan were Rev. Fr. Theodoros Zakarian, Rector of the Jarangavoratz Theological Seminary, and Rev. Fr. Tiran Hakobyan. Under the singing of “Hrashapar”, the Armenian Patriarch of Jerusalem and was lead by a festive procession to the Mother Cathedral. His Grace Bishop Hovnan Hakobyan, Grant Sacristan of the Mother See, greeted His Beatitude on behalf of the Members of the Brotherhood of the Mother See. His Beatitude Archbishop Manougian addressed the clergymen, expressing his spiritual joy for being present in the Mother See of Holy Etchmiadzin. 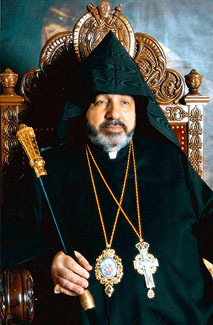 “Indeed, our rare visits do not mean that the Mother See of Holy Etchmiadzin is not in our minds and hearts, on the contrary, for every Armenian, the Mother See is the Spiritual Centre of All Armenians and it always will be, especially so for the Armenians in Jerusalem”, noted His Beatitude. Following the welcoming service, His Holiness Karekin II, Supreme Patriarch and Catholicos of All Armenians; had a meeting with His Beatitude Archbishop Nourhan Manougian. Welcoming the visit of the Armenian Patriarch of Jerusalem to the Mother See of Holy Etchmiadzin, His Holiness happily remarked that during recent days, the Members of the Brotherhood of the Mother See, some of whom are serving in the Diasporan Dioceses and various Armenian communities, have gathered in the Mother See and will be present for the Feast of Holy Etchmiadzin on June 22. During the meeting they reflected on the efforts of the Armenian Patriarchate of Jerusalem, the life of the clergy, as well as the religious life of the Armenian people. During the upcoming days, the Catholicos of All Armenians and the Patriarch of Jerusalem discuss the challenges the Armenian Church is facing, and various issues concerning the national and church live. This entry was posted in Featured News, News and tagged Armenian Patriarch, His Beatitude, His Beatitude Archbishop Nourhan Manougian, Holy Altar, Holy Etchmiadzin by OCP. Bookmark the permalink.